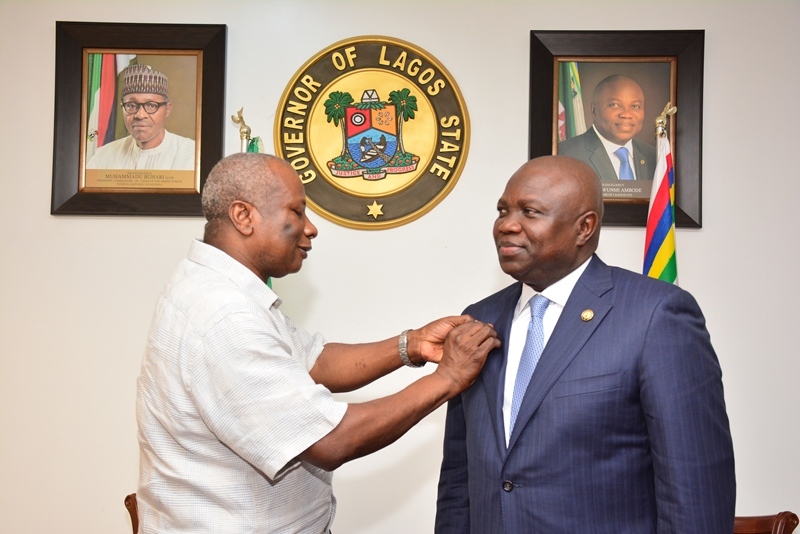 Lagos State Governor, Mr. Akinwunmi Ambode (right), being decorated with the UN lapel by United Nations Resident/Humanitarian Coordinator & UNDP Representative, Mr. Edward Kallon during the UN Resident Representative courtesy visit to the Governor at the Lagos House, Ikeja, on Thursday, April 13, 2017. 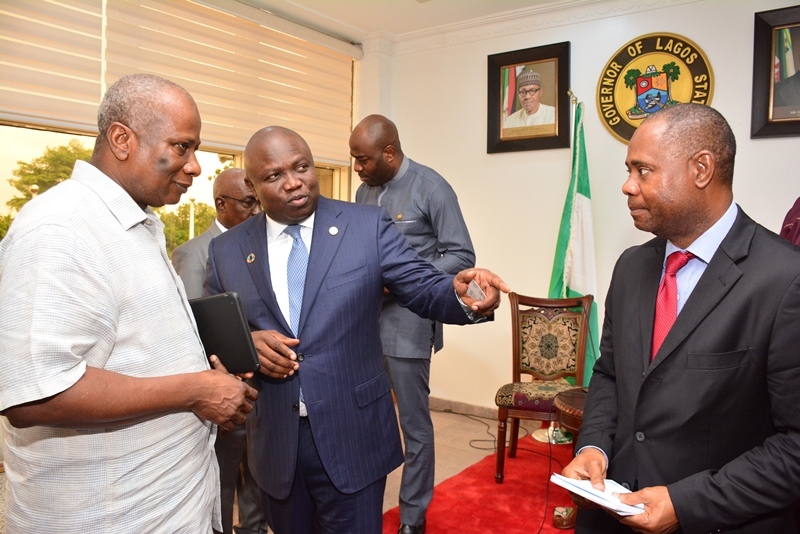 Lagos State Governor, Mr. Akinwunmi Ambode (middle), with the United Nations Resident/Humanitarian Coordinator & UNDP Representative, Mr. Edward Kallon (left) and Special Assistant to the Humanitarian Coordinator, Mr. Frederic Eno (right) during the UN Resident Representative courtesy visit to the Governor at the Lagos House, Ikeja, on Thursday, April 13, 2017. 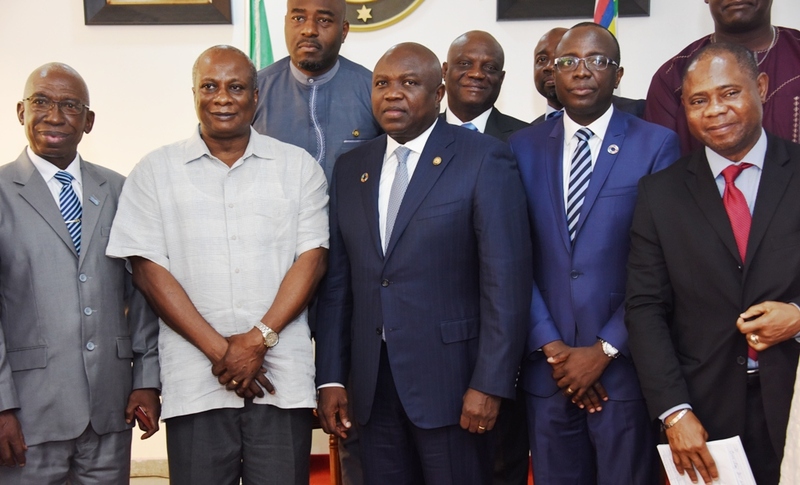 Lagos State Governor, Mr. Akinwunmi Ambode (middle); the United Nations Resident/Humanitarian Coordinator & UNDP Representative, Mr. Edward Kallon (2nd left); UNESCO Senior Programme Specialist – Education, Mr. Saidou Sireh Jallow (left); Commissioner for Finance/Economic Planning & Budget, Mr. Akinyemi Ashade (2nd right); Special Assistant to the Humanitarian Coordinator, Mr. Frederic Eno (right) and Special Adviser to the Governor on Education, Mr. Obafela Bank-Olemoh (left behind) during the UN Resident Representative courtesy visit to the Governor at the Lagos House, Ikeja, on Thursday, April 13, 2017. 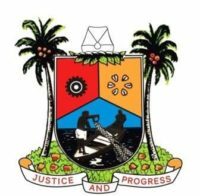 Sensitization and Awareness Campaign Walk with the Theme : “ Access to Inheritance” organised by The Office of the Administrator General and Public Trustee, Ministry of Justice on Thursday 5th April 2018.